An estimation, using a Raman spectroscopic technique, of the Young’s modulus of a single filament of bacterial cellulose is presented. This technique is used to determine the local molecular deformation of the bacterial cellulose via a shift in the central position of the 1095 cm–1 Raman band, which corresponds to the stretching of the glycosidic bond in the backbone of the cellulose structure. By calculating the shift rate with respect to the applied strain it is shown that the stiffness of a single fibril of bacterial cellulose can be estimated. In order to perform this estimation, networks of fibres are rotated through 360° and the intensity of the 1095 cm−1 Raman band is recorded. It is shown that the intensity of this band is largely independent of the angle of rotation, which suggests that the networks are randomly distributed. The modulus is predicted from a calibration of Raman band shift against modulus, using previously published data, and by using Krenchel analysis to back-calculate the modulus of a single fibril. 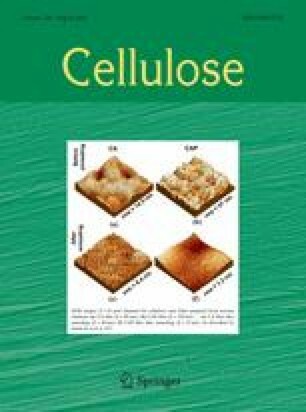 The value obtained (114 GPa) is higher than previously reported values for this parameter, but lower than estimates of the crystal modulus of cellulose-I (130–145 GPa). Reasons for these discrepancies are given in terms of the crystallinity and structural composition of the samples.